In 1999 when the restoration work on palazzo Bomben began, coordinated by architect Tobia Scarpa, the damage caused by the air strike of 7 April 1944 was nothing in comparison to the state of ruin that the building was in, the roof and floors of the north wing having collapsed. It was only possible to proceed with renovation, completed in 2003, after carefully recovering the collapsed materials. Little was saved of the original north wing, which now houses the modern auditorium. On the other hand, the large entrance hall was left unchanged, characterised by two large arched doorways, now closed with glass doors leading to two yards. The smaller one, located on the left side of the complex, now houses a sculpture by architect Carlo Scarpa, a gift made to the Foundation by his son, Tobia. The other arch leads to the large garden which extends all the way to the edge of the Roggia and which joins palazzo Bomben to palazzo Caotorta, in a design by Domenico Luciani, with the cooperation of Ippolito Pizzetti and Luigi Latini. 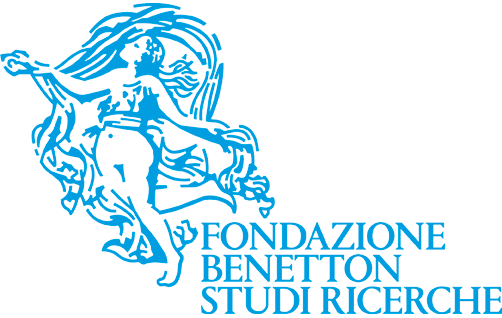 The now renewed spazi Bomben serve as a venue for public scientific and popularising initiatives organised by the Foundation itself or in cooperation with other entities and associations, and also intend to offer the city a suitable venue for various types of public cultural events. 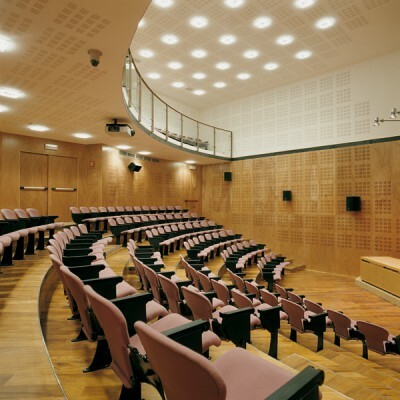 The auditorium, located on the ground floor of palazzo Bomben, with floor and gallery seating for 150 people, features a projection room with multimedia equipment. Specifically, the auditorium has: a screen for video projection; amplification system; video-conference connection; slide projectors; connections for laptops which can be used from the table in the theatre or from the projection room; two simultaneous interpreting booths. The furnishings, architectural features and materials used assure excellent viewing and the ideal acoustic quality for music performances. The seminar hall, located on the third floor and accessible directly with the elevator, can accommodate up to 50 people and has similar technical features to the auditorium. 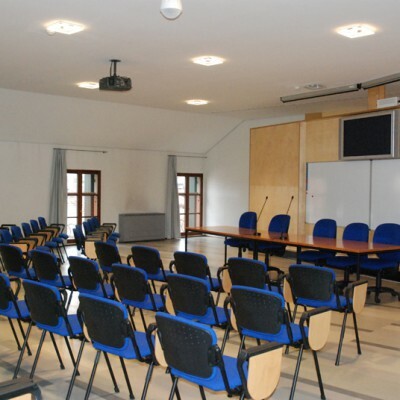 It is used for presentations, meetings, seminars and conventions with a limited number of participants. The hall has a small coat check and its own restrooms. 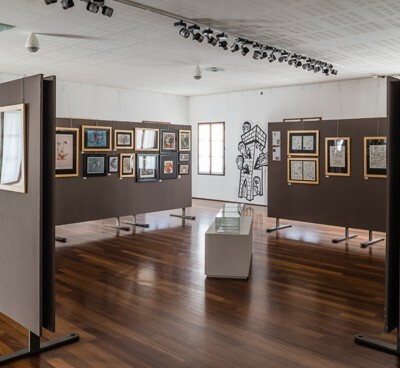 The exhibition spaces, covering approximately 350 square metres in total, are on the piano nobile and arranged into four rooms, which may also be used separately. In each room it is possible to request the use of display cases and panels, designed and constructed by architect Tobia Scarpa for the opening of the Foundation’s new premises. The sala della Roggia, located in the north wing of the building, is the largest exhibition space, measuring approximately 140 square metres. As the only room without any fresco decorations, its perimeter walls may also be used to display the materials. 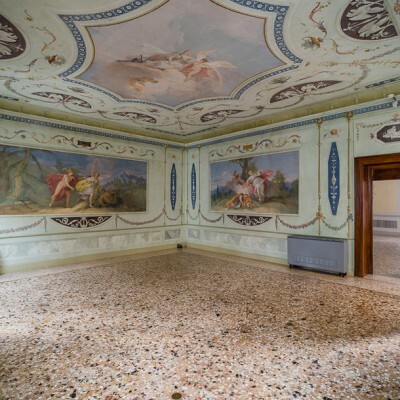 Sala delle Vedute, of 79 square metres, is the first hall that one accesses from the palazzo’s main staircase. 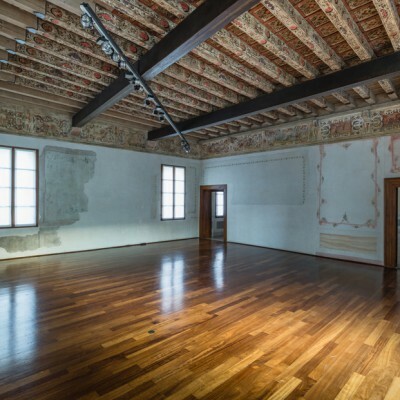 The distinguishing element of the room is the precious 16th century decorated ceiling, discovered and restored during the renovation works. To the right one enters the sala delle Ore, measuring approximately 74 square metres and embellished with early 19th century frescoes and original plaster work, attributed to the painter Giovanni Battista Canal. 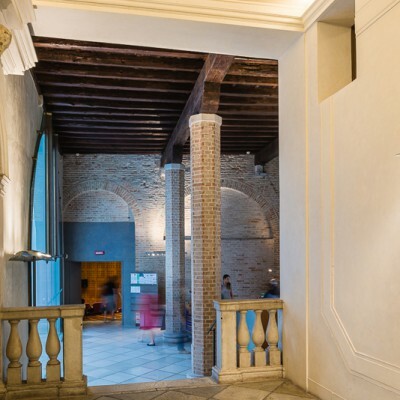 The exhibition route ends with the sala dei Miti, the smallest (approx. 58 square metres) but also the most richly decorated room, with unmistakably neoclassical mythological depictions, also by Canal. 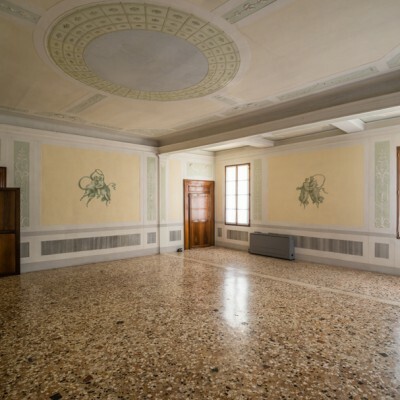 The ground floor of the Palazzo also features a spacious hallway suitable for coffee breaks, aperitifs, buffets and has a coat room and restrooms. The garden between the two buildings, overlooking the Roggia canal, is the ideal venue for a variety of outdoor events such as concerts, readings, theatrical readings, public meetings. During the summer a raised platform (4×8 metres) and folding chairs are set up, with total seating capacity of 90 people.